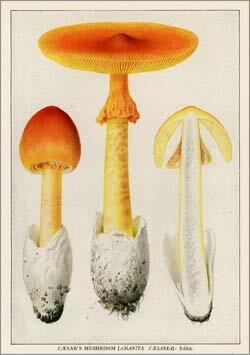 Fungi are a fascinating subject for botanical artists, although not a common one. Perhaps this is because mushrooms present difficulties for artists that they don’t usually encounter with plants. The first and highest hurdle to overcome is finding them. Once found, most mushrooms must be drawn in short order as they won’t hold up well when removed from their growing medium—some may even dissolve into an inky mess. But for a few stalwart devotees, fungi become a specialty. One of the finest American mycological artists is Louis Charles Christopher Krieger (1873-1940), an artist who worked with David Griffiths on the Opuntia project at the U.S. Department of Agriculture from 1912 to 1917 ( The Desert Breeze , October 2013). Besides painting innumerable cacti, Krieger also painted fruit and plant diseases for various USDA publications, but his passion was always fungi. He worked at the USDA at three separate times in his life, and in between positions there, he was passionately involved with mycology. He began painting mushrooms during his first job at the USDA in its Division of Microscopy (1891-1895). After the Division was disbanded, he worked as a portrait artist and teacher. Beginning in 1905, he worked for ten years as a botanical illustrator for William Farlow, a mycologist at Harvard University, assisting in the production of Farlow’s Icones Farlowianae: Illustrations of the Larger Fungi of Eastern North America . During this time, Krieger produced more than 350 illustrations of mushrooms and began a 30-year project to index the world’s mycological literature. Following his second term at the USDA illustrating the Opuntia for Griffiths (1912-1917), Krieger spent ten years working for Dr. Howard A. Kelly, a Baltimore physician. Besides cataloguing Kelly’s large mycological library, Krieger produced another set of some 300 illustrations of mushrooms. In 1928, Dr. Kelly donated his library and Krieger’s paintings to the University of Michigan and requested that it be called the “L. C. C. Krieger Mycological Library.” After completing his work with Dr. Kelly, Krieger wrote several articles for Mycologia and other journals, including a very thorough article on the history of mycological illustration. He was named Mycologist to the New York State Museum and wrote and illustrated A Popular Guide to the Higher Fungi (Mushrooms) of New York State . His third and final stint at the USDA began in 1929. He spent a year in Cuba with David Griffiths illustrating diseases of sugar cane, and in the 1930s painted over 80 watercolors of fruit that are now part of the USDA’s Pomological Watercolor Collection. He died in 1940, leaving several ambitious projects unfinished. 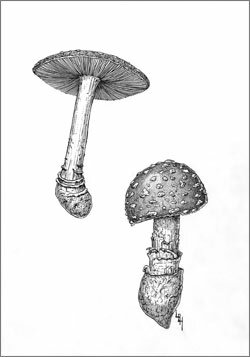 Two species of Amanita mushrooms are shown here in illustrations by Krieger and Lucretia Hamilton. Hamilton’s illustration of the Fly Agaric, Amanita muscari, was produced for Plants That Poison and drawn from specimens collected in the Catalina Mountains on August 11, 1969. 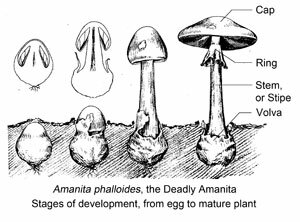 The drawing shows two stages of development of the mushroom: the immature form with its hemispherical cap and the mature form with the cap fully extended to expose the gills. Krieger’s illustration of Amanita caesarea, or Caesar’s Mushroom, is one of 16 full-color plates of various mushrooms included in his article “Common Mushrooms of the United States” that was published in The National Geographic Magazine in May, 1920. At the time, it was one of the magazine’s most successful articles with both mycologists and laymen. This painting beautifully illustrates the main structural features of this type of mushroom. At the base of each specimen is the volva, a broken veil that once covered the entire mushroom. Near the top of the stem, or stipe, is a skirt-like ring, the remains of a veil that originally covered the gills before the cap, or pileus, expanded. This appeared in the October 2015 issue of The Desert Breeze, the monthly newsletter of the Tucson Cactus and Succulent Society.